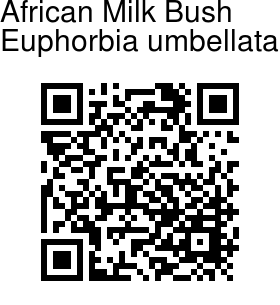 African Milk Bush is a succulent shrub or small tree native to East Central Africa. In nature, the plants will reach up to 12 feet in height with an equal spread. The leaves are fleshy, spirally arranged, crowded towards the ends of stems, 7.5-10cm long and 2.5-4cm wide, dark green above and paler beneath, with a prominent midrib. Leaves are crowded at the tips of the fleshy green branches, which gives rise to a light grey bark. The flowers are green to yellowish-green, mostly concealed by lance-shaped bracts that are purplish-green above and reddish-purple beneath. The sap is extremely irritating to the skin, eyes and mouth. Skin contact can cause blisters. All plants parts are considered very poisonous. This one should not be grown around small children or animals that like to eat plants. African Milk Bush is propagated from cutting and from seed. Medicinal uses: Although toxic and very caustic to the skin and mucous membranes, the latex has sometimes been used internally, particularly to deal with internal parasites. Several drops of latex from warmed leaves are taken to expel intestinal parasites and sometimes tapeworm. 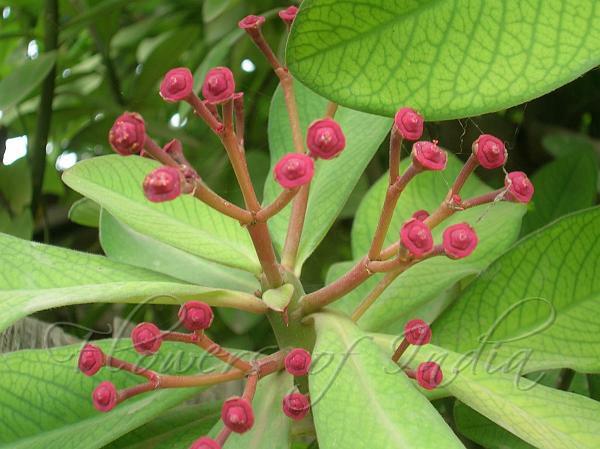 The leaf sap is also used to treat cardiac problems and excessive menstruation. A few drops of the latex is applied topically to warts, the latex is also applied to sores as a treatment for syphilis. The latex is applied to abscesses in order to mature them. Identification credit: Tony from Sydney Photographed in Manipur & Maharashtra.